Step-by-step Enterprise Architecture development with ADM guided process. 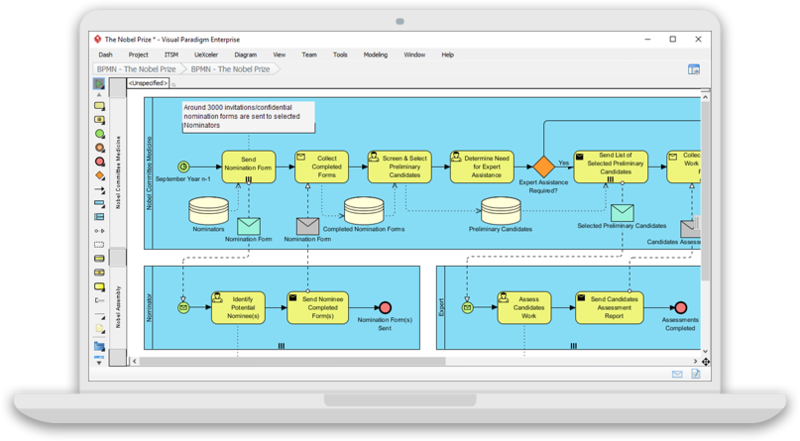 Perform project management with PMBOK process map, user story mapping, visual modeling (UML, BPMN, etc) and more. Walk through the ADM phases under our TOGAF ADM navigator. For each phase, walk through the activities involved (as shown in the figure on the right). For each activity, follow the guidance to perform the actions required, which typically involves drawing diagram (e.g. Spider chart for Capability Analysis) and form-filling (e.g. Request for Architecture Work). That's it! Your work is automatically formulated into deliverable form, readily be exported as TOGAF ADM deliverable. 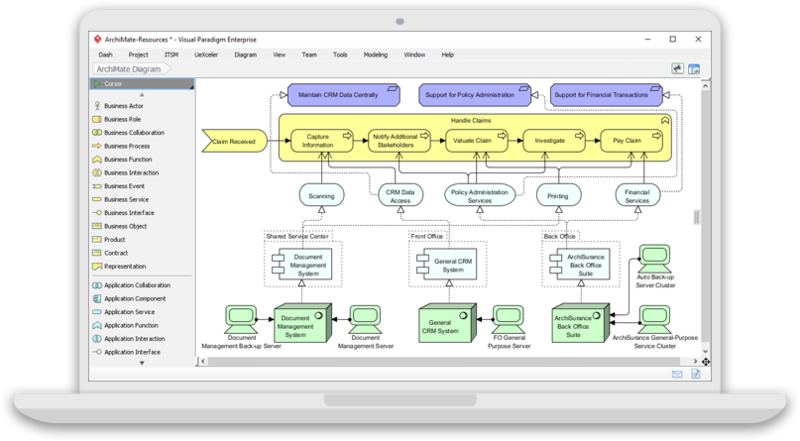 Visual Paradigm Enterprise is an ArchiMate enterprise architecture tool certified by The Open Group. 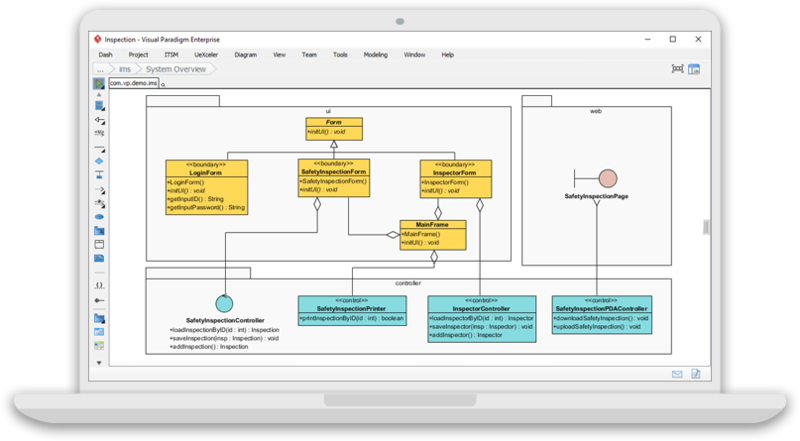 It supports all the vocabulary, notation, syntax, and semantics for all ArchiMate language elements and relationships. 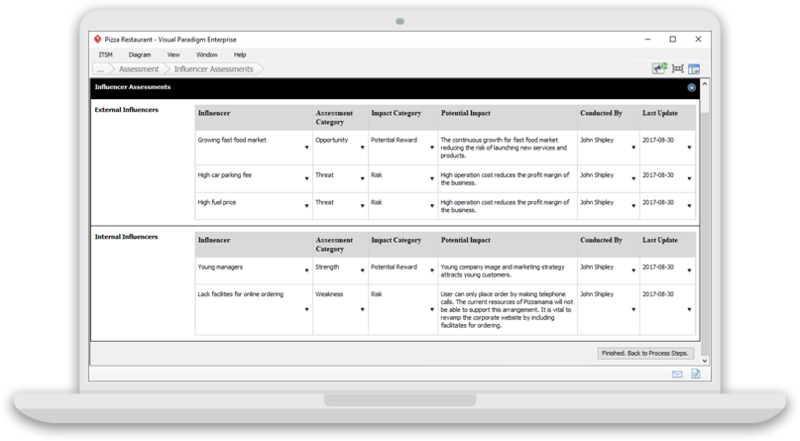 You can also create model views with any of the official viewpoints (examples) or user-defined viewpoints. 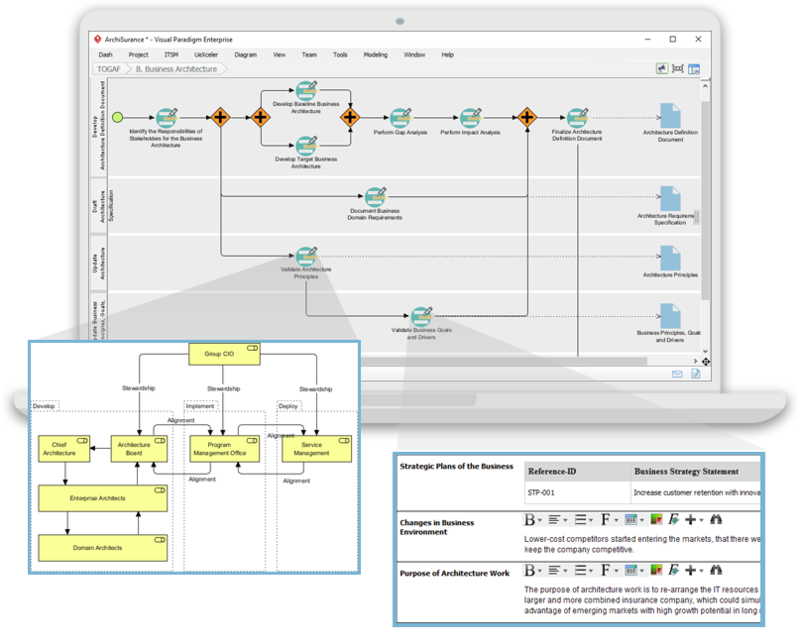 Visual Paradigm also support ArchiMate 3.0 Model Exchange File Format. We help project teams adhere to the PMBOK with lower cost and risks. 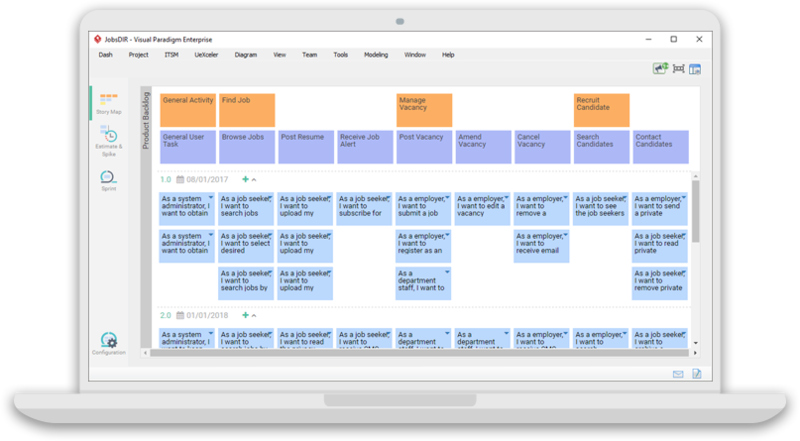 With the Just-in-Time PMBOK process map, your team can perform and manage project-management activities in a unified environment. We provide all the necessary forms and project management tools (e.g. 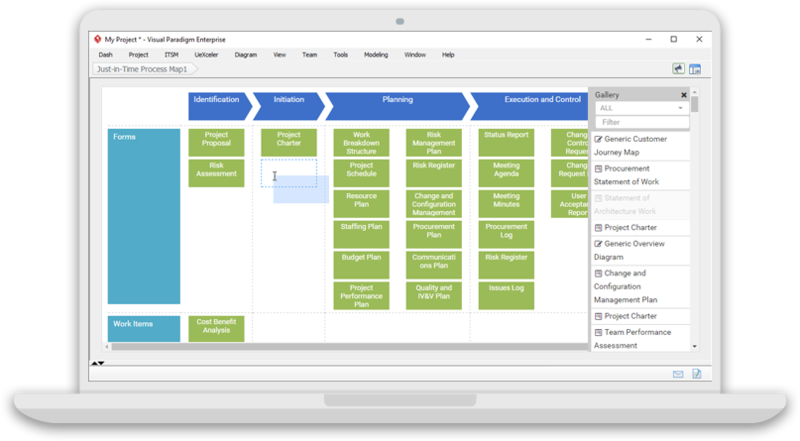 Breakdown Structure diagram, organization chart, RACI, etc) you need in project management. As you progress through the phases, your work will be automatically archived in form of process deliverables, readily be exported into document files. 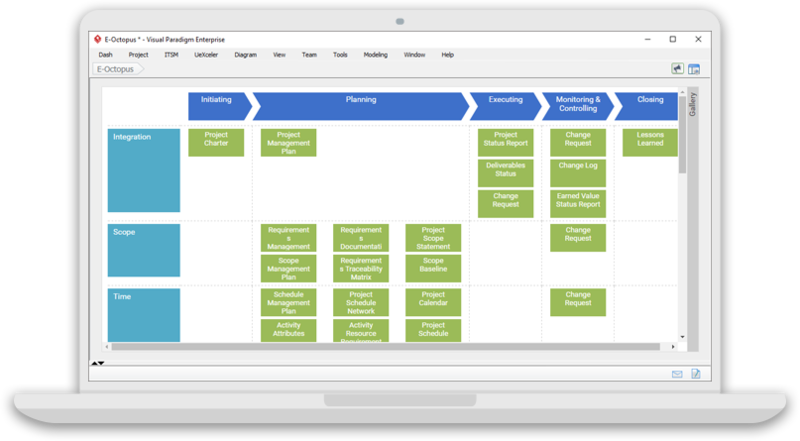 Besides PMBOK, we also feature a generic project management process map that comes with 4 complexity levels, fitting all IT projects, regardless of their size. The OMG Business Motivation Model (BMM) provides an excellent framework for developing, communicating and managing strategic plans. This framework reflects widely accepted strategic planning techniques, helping you identify strategic drivers and strategic goals in strategic planning. BMM Guide-Through features a generic process that assists you in developing a Business Motivation Model. By following the process step-by-step, the core components of strategic planning will be identified. The resulting information will be archived in document form automatically. 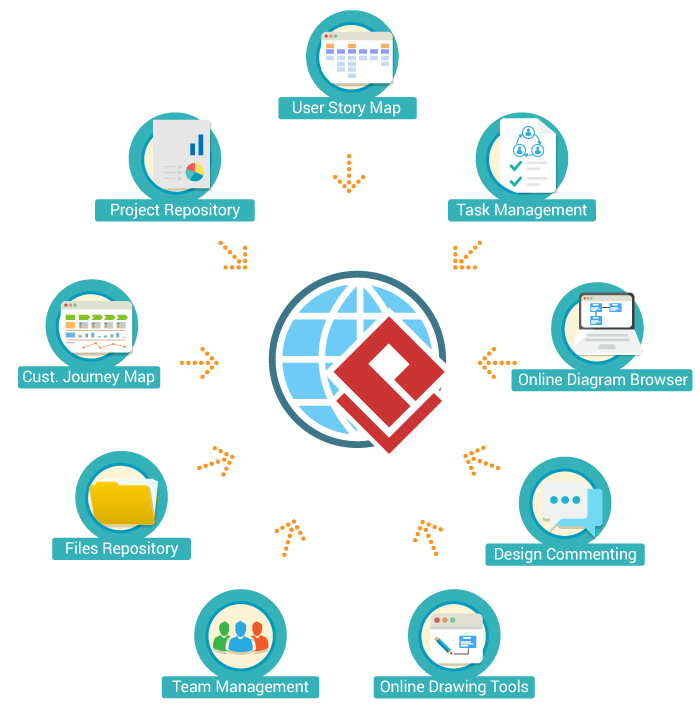 Flexibly build your own development process with a process map, and plug the work items we provided into the map. We have a huge repository of PMBOK, TOGAF and generic work items and tools that cover different project management and EA needs. Team members can complete the actions required under the work items to get the work done and get the process finished.